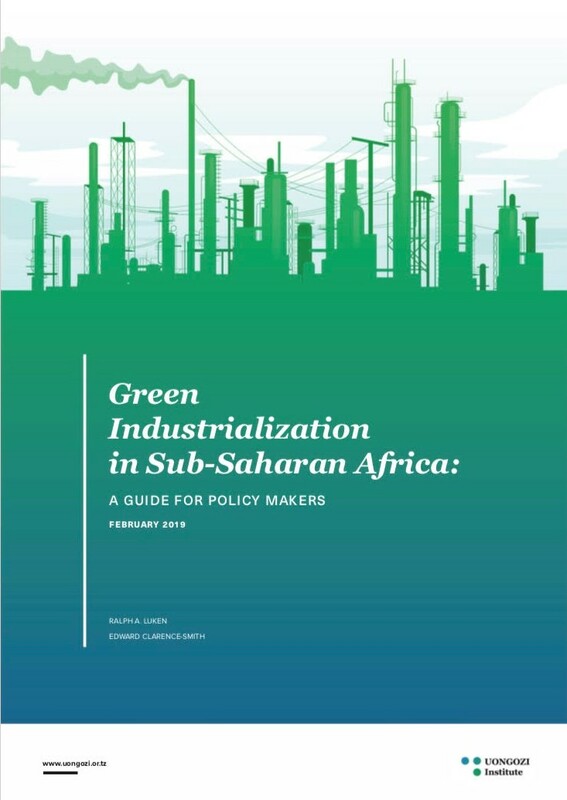 This guide provides information for policy makers and planners on formulating policies and programmes that are supportive of green industrialization in countries in Sub-Saharan Africa (SSA). The guide is structured in the following six sections. Section 1 defines “green industrialization” and the related concepts of “green economy”, “green growth” and “green jobs”. Section 2 identifies potential data sources and indicators for measuring industrial resource use and environmental pollution, which are essential for assessing and monitoring progress towards green industrialization. Section 3 describes common policies, programmes and instruments for directly greening industries and services. Section 4 identifies other national policies that can contribute to green industrialization. countries: Nigeria, Ghana and Senegal. Section 6 concludes the guide. Inspired by the success of countries in East Asia, the Government of Tanzania is aggressively pursuing industrialization as a strategy to accelerate socio-economic development, create jobs and substantially reduce poverty. Notably, many economies in that region achieved a high level of industrialization and economic transformation through the participation of a large state-owned enterprises (SOEs) sector. This leads to the question: What role can SOEs play to support industrialization in Tanzania? To stimulate and exchange views on this critical issue, the UONGOZI Institute in collaboration with the Office of the Treasury Registrar within the Ministry of Finance and Planning convened a roundtable policy forum in July, 2018. This brief summarizes the key messages and policy recommendations from the meeting. This report provides a summary of the discussions that took place at the ALF 2017 follow-up meeting. The Office of the Vice President of the Republic of Ghana in collaboration with UONGOZI Institute of the United Republic of Tanzania co-organized a two-day regional forum for stakeholders in the extractive sector to discuss how African countries should position themselves to optimize benefits from the extractive sector through the design and implementation of value addition strategies. The forum was held in Accra, Ghana, on 4-5 December 2017. The Forum was officiated by the Vice President of the Republic of Ghana, H.E. Dr. Mahamudu Bawumia, with welcoming remarks from Hon. John Peter Amewu, Ghanaian Minister of Lands and Natural Resources. Participants included high-level representatives from the public and private sectors, academia and civil society. In total, about 100 participants from 15 countries attended. This report summarises the deliberations that took place at the forum. 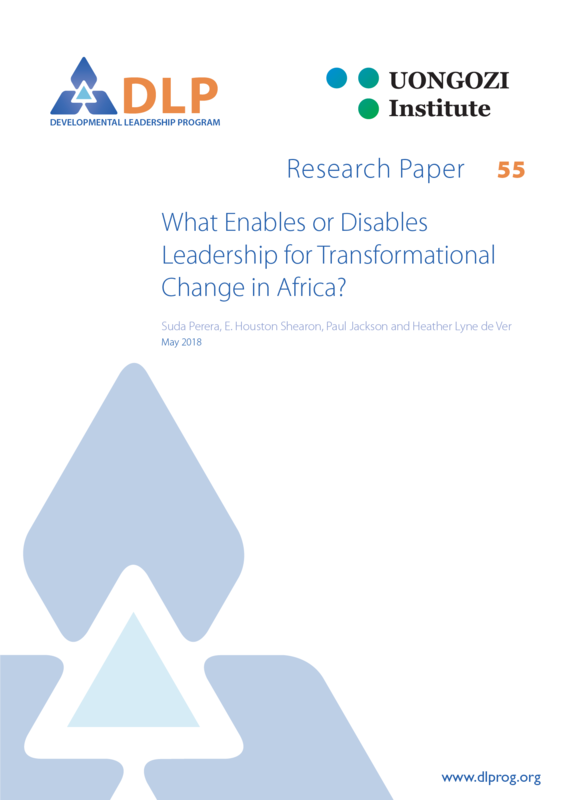 Research Paper: What Enables or Disables Leadership for Transformational Change in Africa? This paper reviews the findings of a study that hypothesised that leadership had been instrumental to bringing about change in Africa but acknowledged that what constituted leadership, and how leadership had facilitated change, was poorly understood. The study covered nine case studies from six African countries: Democratic Republic of the Congo (DRC), Ethiopia, Ghana, Tanzania, South Africa and Uganda. In 2012, a small youth-led movement emerged in Goma, Democratic Republic of the Congo (DRC). This called itself LUCHA, a portmanteau of the French phrase Lutte pour le changement (‘struggle for change’). What differentiated LUCHA from many other movements that had emerged in the eastern DRC was that it was explicitly against the use of violence. Rather, LUCHA sought to use peaceful protest to hold the Congolese government to account and agitate for change for Congolese citizens. 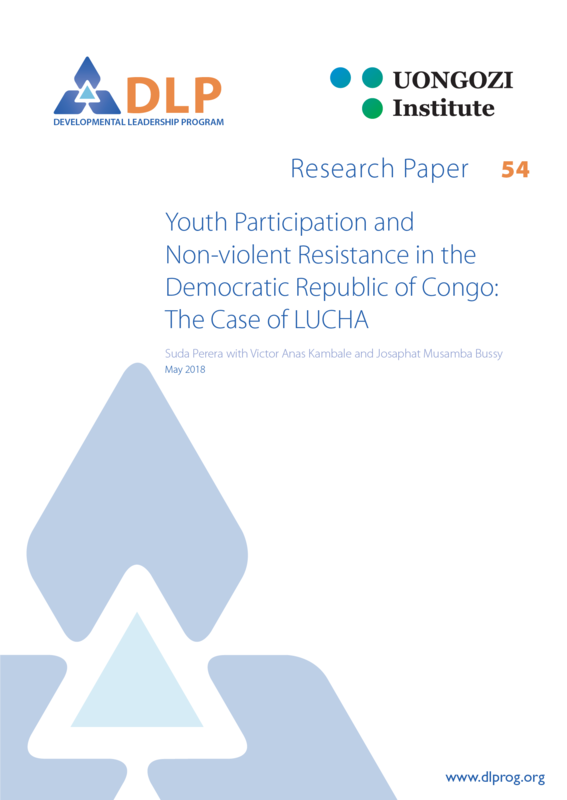 This paper presents a case study of LUCHA as an example of leadership for transformational change in DRC. It finds that bringing about political change—both at the elite level and in terms of the civic empowerment of the Congolese people—is one of the guiding principles of LUCHA, and seeks to unpick how the movement has brought about this change. It finds that LUCHA’s horizontal leadership structures and collaborative form of leadership have been instrumental in its success, although at times its leadership style has also created certain divisions within the movement. While the study focuses primarily on the single case of LUCHA in DRC, it draws on literature that examines youth, horizontal leadership and social movements from around the world, as well as literature on similar African youth movements, such as Y’en a marre in Senegal and Le balai citoyen in Burkina Faso. This paper examines the introduction of community policing in Dire Dawa, Ethiopia, and the relationships in the district between formal policing structures and non-state security actors. It draws on fieldwork (spring, 2017) to show that these relationships are complex – there is neither a simple dichotomy between state and non-state nor an emerging clear and hybrid system. Rather, the institutional multiplicity available gives a series of choices to those seeking justice and also to those providing it. The community police initiative offers a positive way of reducing friction between the different policing providers – by acting as an interlocutor, but also by recognising the legitimacy of local actors in some instances and enforcing the state’s legitimacy in others. In this way, local providers can use local actors to enhance their reach and effectiveness but also to extend the reach of the state and the legitimacy of the law at the local level. Achieving peace and security in Africa is of the utmost concern not only due to the immediate, destructive and often fatal outcomes from outbreaks of violence, but also because the presence of conflict undermines the continent’s long-term sustainable development. Consequently, the African Union has given peace and security due prominence. “A peaceful and secure Africa” is one of the key aspirations of the AU’s Agenda 2063 with the goal that “by 2020 all guns will be silent.” The continent has also put in place the African Peace and Security Architecture (APSA), a set of structures for the prevention, management and resolution of crises and conflicts, as well as post-conflict reconstruction. Unfortunately, despite these intentions and efforts to date, lasting peace and security on the continent remains elusive. It is against this background that H.E. Thabo Mbeki, former President of South Africa, and H.E. Benjamin Mkapa, former President of the United Republic of Tanzania, convened the fourth African Leadership Forum (ALF) in Johannesburg on 24-25 August 2017 under the theme “Peace and Security for an Integrated, United and Sustainable Africa”. 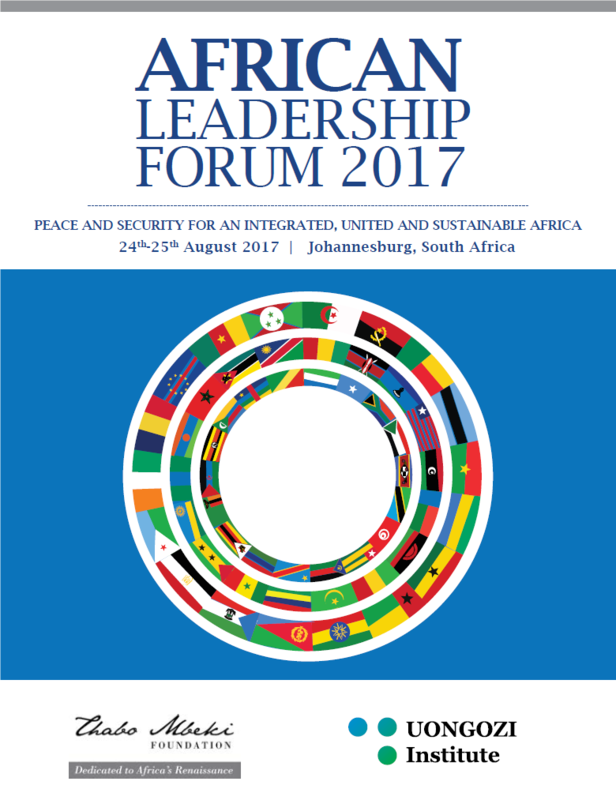 This publication provides a summary of the deliberations that took place at the African Leadership Forum 2017. 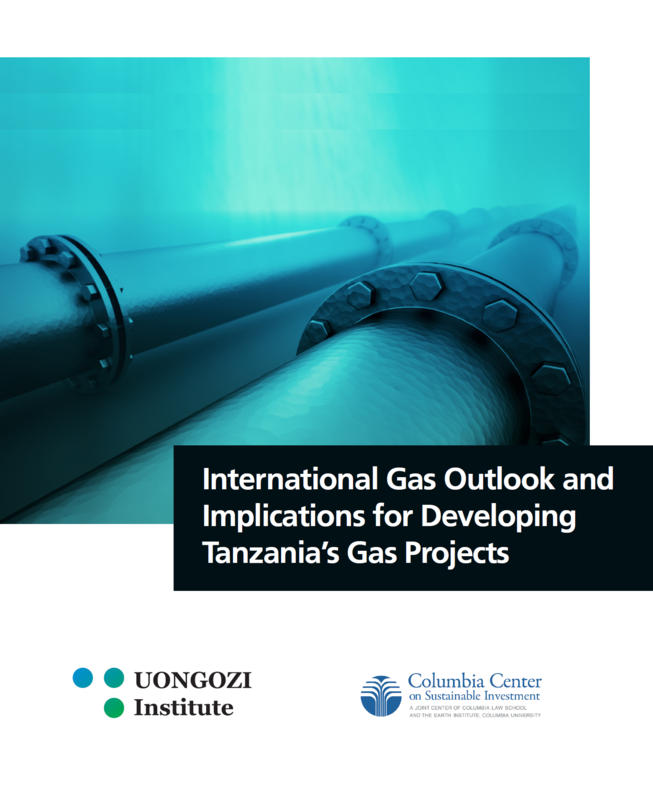 This brief reviews recent international gas developments, the outlook in this regard and implications for the development of proposed offshore gas projects in Tanzania. As the country aims to benefit from its gas discoveries by increasing its domestic gas use, it also outlines some of the trade-offs and considerations that need to be taken into account when negotiating the domestic gas allocation. 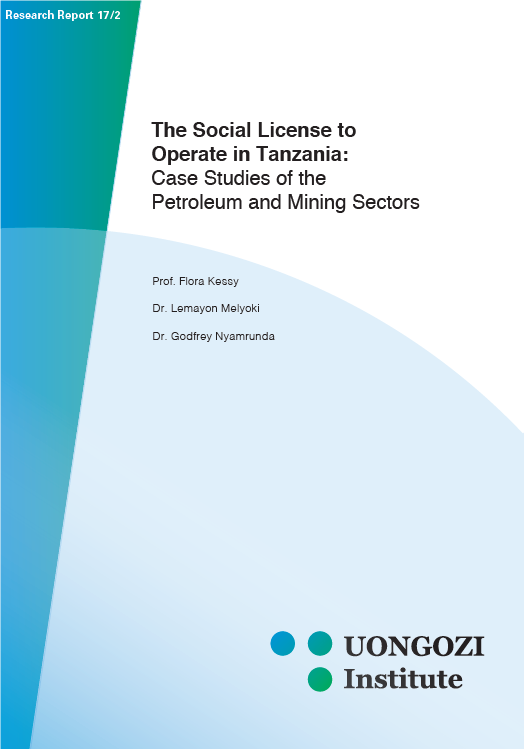 The concept of a social license to operate (SLO) has become a key issue for companies, researchers, policy makers and other stakeholders in the extractive sector. Securing ‘social permission’ for extractive activities is increasingly seen as critical for the future profitability and sustainability of the sector. Despite the long history of extractive activities in Tanzania, very few studies have examined SLO from the perspective of local communities. This research, therefore, sought to assess whether SLO exists in two of Tanzania’s leading extractive sectors (mining and petroleum) by seeking the perceptions of community members and local officials in the areas around a sample of large-scale mining operations in the country. For the purposes of the research, a conceptual framework was developed for identifying and assessing the key factors involved in gaining and maintaining an SLO. An exploratory qualitative study was then conducted to confirm the elements of the framework, establish whether SLO existed in practice in the Tanzanian context, and document the attendant processes. UONGOZI Institute in collaboration with the Ministry of Land, Water, Energy and Environment of Zanzibar organized the regional roundtable “Extractives for Human Development: Maximizing Domestic Participation Along the Value Chain,” on 27-28 October 2016. 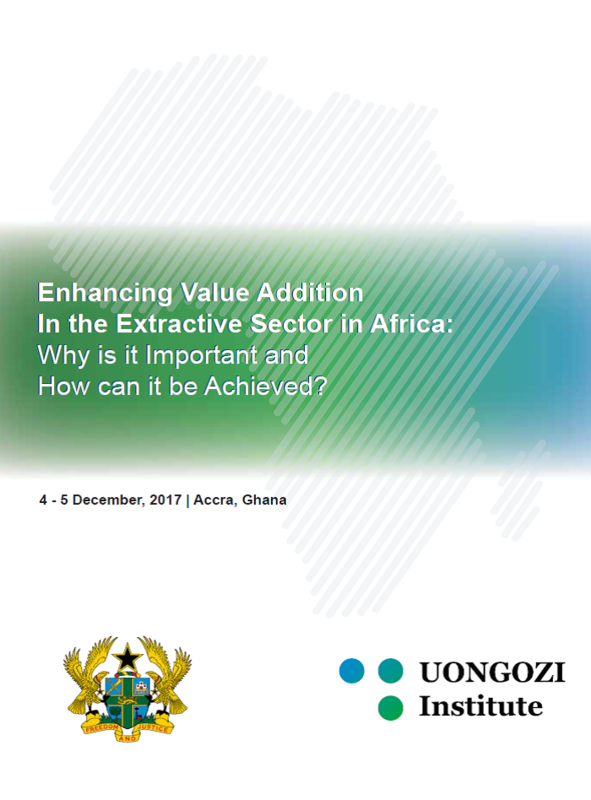 The forum brought together stakeholders in the extractive sector from Tanzania and internationally, including representatives from Kenya, Uganda, South Africa, Sierra Leone and Ghana. Delegates included high-level representatives from the public and private sector, academia and civil society. 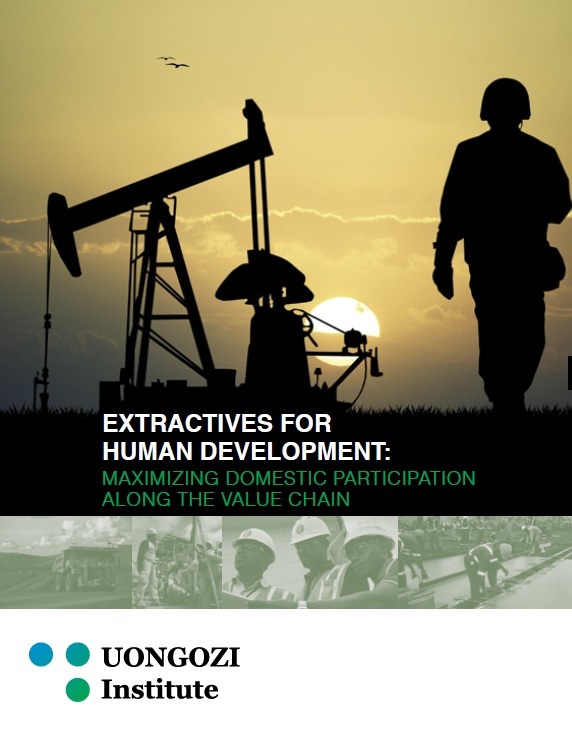 The event featured a series of expert presentations and two broad-ranging panel discussions with the primary goal of examining how to optimize benefits from domestic participation in the extractive sector. This is a report of the roundtable discussion. 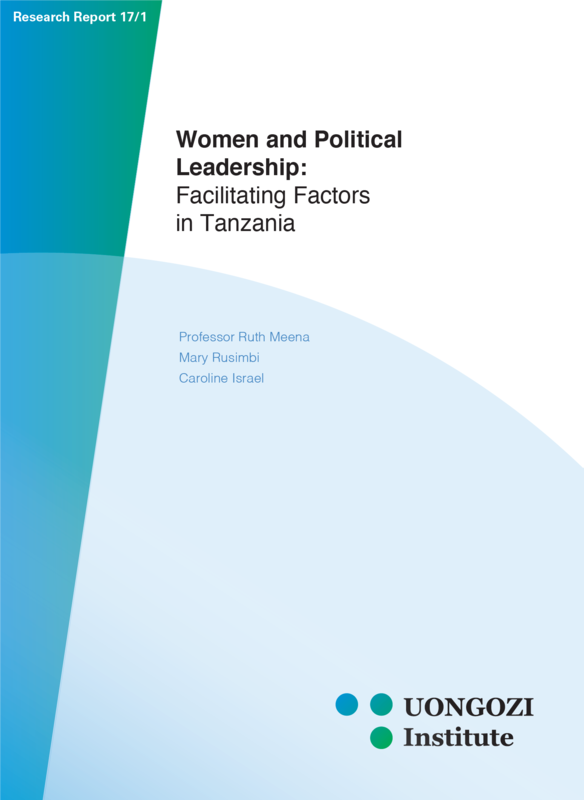 Based on a women and empowerment framework, this study used a life history approach to identify the factors in their life cycle that influenced and helped women during their journey to political empowerment in Tanzania. Twenty women shared with the authors their lived experiences of this journey. This study shows that parents, particularly fathers, played a central role in their empowerment, either by investing in their daughters’ education or by inspiring them and serving as role models to them. Further, most of the women interviewed indicated that their spouses supported their leadership journey by providing emotional support and the financial resources needed, and by helping them to maintain a family-work balance. The respondents underscored the importance of these role models, who, as they explained, stirred their interest, supported their determination to make a difference and their personal ambition to attain a leadership role, and inspired in them a personal desire to serve others. Schools and teachers also influenced them on this journey; nurturing the respondents’ leadership talents by giving them leadership roles when they were schoolgirls, encouraging their progress, and serving as another form of role model. Both informal and formal networks were key resources in enhancing the participants’ capacity and in supporting their aspirations to fulfill their potential. Public-private partnerships (PPPs) for infrastructure involve the private sector in designing, building, financing and operating public infrastructure in sectors such as power generation, transportation (e.g. toll roads or railways), utilities (e.g. water supply), social infrastructure (e.g. hospitals) and government accommodation. Unlike privatisation, infrastructure procured through a PPP remains a public-sector asset. The growth in PPPs has been attributed to several reasons, including increased efficiency in project delivery and operation; reinforcing competition; access to advanced technology; and reducing government budgetary constraints by accessing private capital. The development of PPPs in sub-Saharan Africa has been relatively slow compared to other parts of the developing world but is now gathering pace. 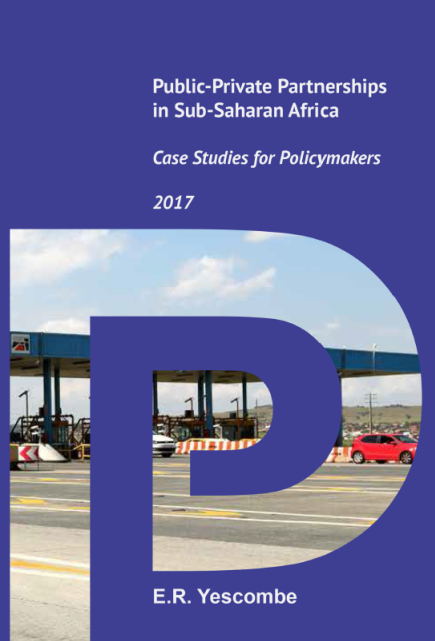 These case studies are intended to give policymakers in sub-Saharan Africa an insight into the ‘real world’ of PPPs in the region. The case studies illustrate some of the key policy issues that have to be considered, and obstacles that have to be overcome, both when procuring a PPP and while managing the PPP contract over its life. Lessons learned from these case studies can be used to shape more effective PPP policies. 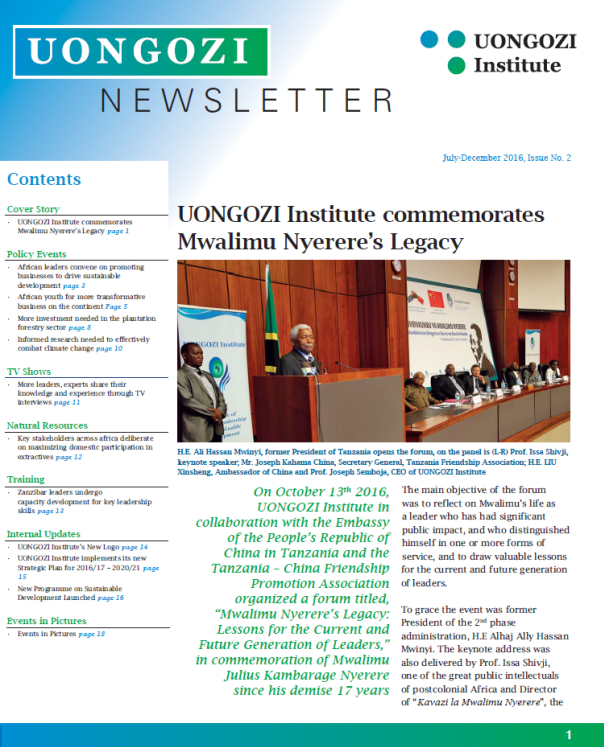 This issue of UONGOZI Institute’s newsletter provides an account of the key events and activities that took place in the period of July – December, 2016. Malgré des progrès énormes accomplis au cours des années récentes, l’entreprise en Afrique continue à faire face aux défis considérables, notamment le manque d’infrastructures, surtout l’alimentation énergétique fiable, le manque de capitaux, particulièrement pour les petites et moyennes entreprises (PME) et le secteur agroalimentaire. C’est dans ce contexte que l’ancien Président de la République-Unie de Tanzanie, S.E. Benjamin Mkapa, a convoqué le 3ème Forum des dirigeants africains (FDA) à Dar es Salaam du 28 au 29 juillet 2016 autour du thème « Mettre les entreprises africaines en mesure de transformer le continent ». Organisé par l’Institut des dirigeants africains pour le développement durable, connu communément sous le nom de « Uongozi Institute » (Institut de leadership), le Forum regroupe les dirigeants politiques, notamment des anciens chefs d’Etat ainsi que des dirigeants gouvernementaux, des chefs d’entreprise, des organisateurs de la société civile et le monde universitaire. Un discours liminaire et une séance plénière et publique suivis de trois tables rondes à huis clos ont marqué l’événement. Pour la première fois cette année, des représentants choisis parmi la jeunesse ont été invités pour tenir des séances parallèles. A la fin de l’événement, le Forum de la jeunesse a fait une déclaration. 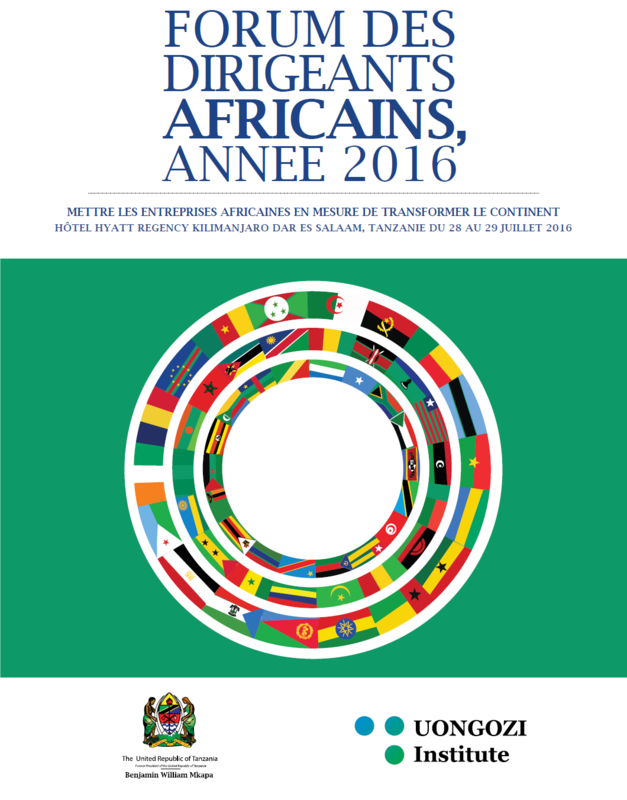 Cette publication présente un résumé des discours et des délibérations qui ont eu lieu lors de l’Forum des dirigeants africains 2016. Despite tremendous progress in recent years, African business still faces significant challenges, including the lack of infrastructure, particularly reliable power supplies, and lack of capital, especially for small and medium-sized enterprises (SMEs) and farmers. It is against this background that the former President of the United Republic of Tanzania H.E. Benjamin Mkapa convened the third African Leadership Forum (ALF) in Dar es Salaam on 28-29 July 2016 under the theme “Enabling African Businesses to Transform the Continent”. 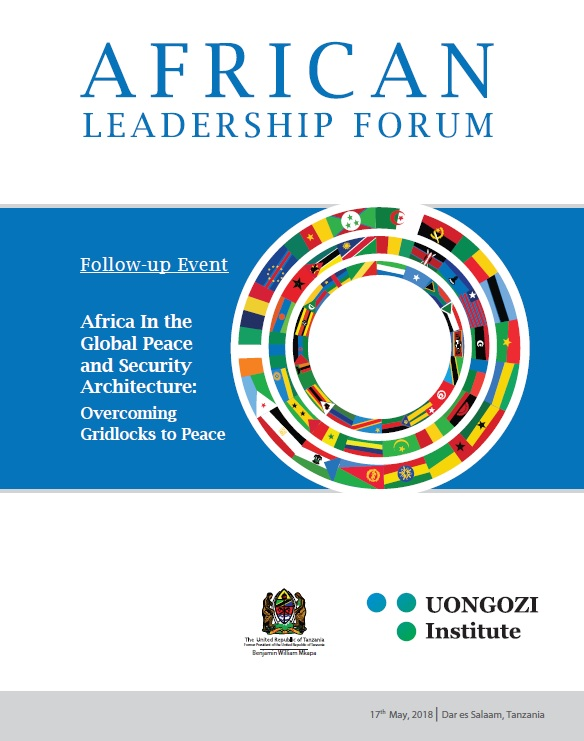 Organized by the Institute of African Leadership for Sustainable Development, popularly known as the UONGOZI Institute, the Forum brought together political leaders including former heads of state as well as leaders from government, business, civil society and academia. The event featured a keynote address and public plenary followed by three closed panel sessions. For the first time this year, selected youth representatives were invited to hold parallel sessions. A Statement from the Youth Forum was delivered at the conclusion of the event. 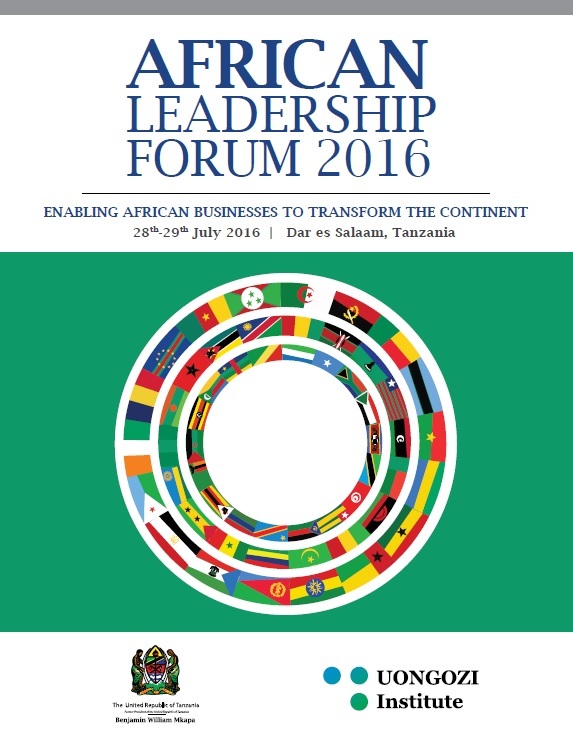 This publication provides a summary of the deliberations that took place at the African Leadership Forum 2016. Tanzanian government to improve governance in the extractive sector and to secure the best possible returns for the country while bringing about broad-based domestic growth and development. The extractive sector is one of the key growth sectors in many countries in Africa, including Tanzania. However, the sector also has the largest incidence of conflicts and disputes between resource companies and local communities. Managing relations within the extractive industry is, therefore, a key consideration to secure optimal benefits from the sector. 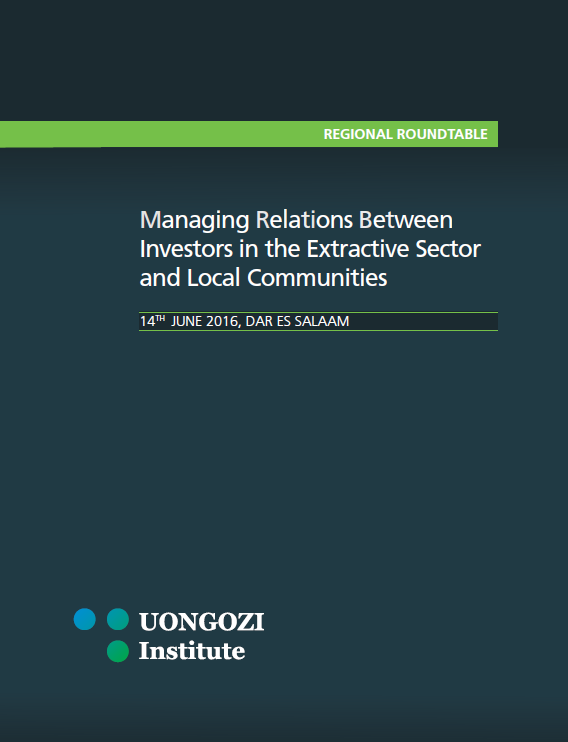 UONGOZI Institute organized a regional roundtable on the theme Managing Relations between Investors in the Extractive Sector and Local Communities in June, 2016. This publication provides a summary of the roundtable discussion. 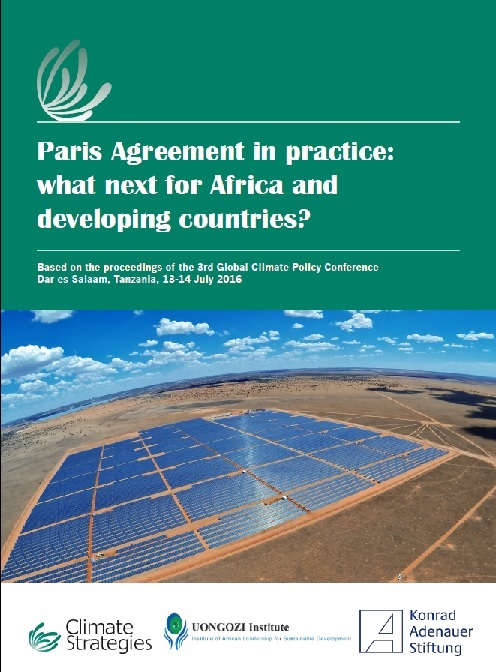 This report summarises findings of the 3rd Global Climate Policy Conference (GCPC) held on 13-14 July 2016 in Dar es Salaam, Tanzania. The conference was convened by Climate Strategies, a network of senior climate policy researchers, in partnership with the Institute of African Leadership for Sustainable Development (UONGOZI Institute) and the Konrad-Adenauer-Stiftung. 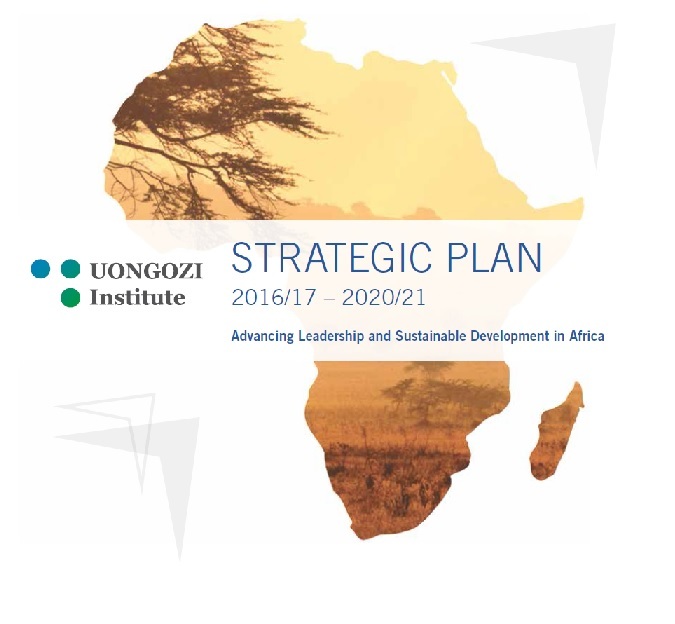 This is UONGOZI Institute’s second five-year strategic plan. Under this new strategic plan, the Institute will continue on its course of becoming a centre of excellence for leadership for sustainable development in Africa. Recognizing the critical importance of integration to the transformation and sustainable development of Africa as envisioned by Agenda 2063, the former President of the United Republic of Tanzania, H.E. 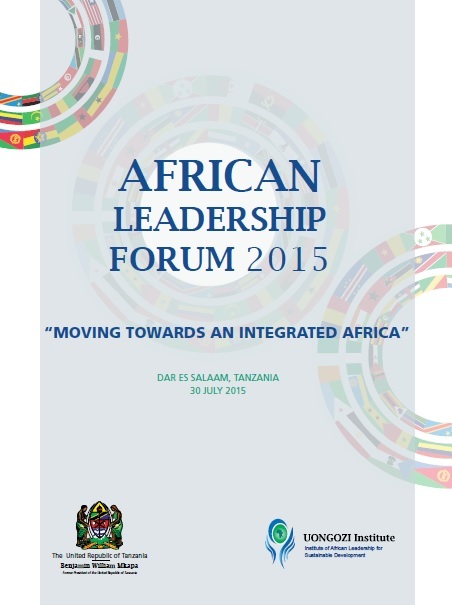 Benjamin Mkapa convened the second African Leadership Forum (ALF) in Dar es Salaam on 30 July 2015. The event brought together political leaders, including current and former Heads of State, as well as leaders from government, business, civil society and academia. The theme of the Forum was “Moving Towards an Integrated Africa”. The event provided a platform to explore how best to overcome the obstacles to intra-African interaction, collaboration, coordination and harmonization so that Africa’s richness could be better marshalled to realize the common goals of prosperity and security of the continent and its people. 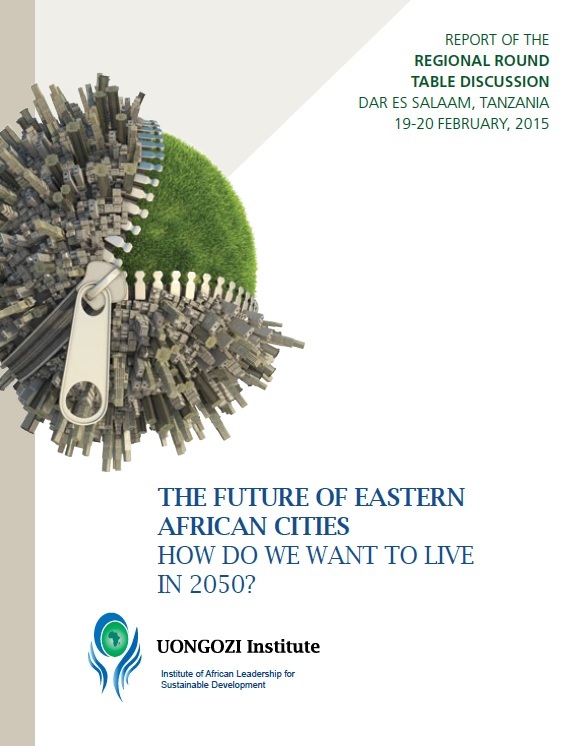 The Future of Eastern African Cities: How do we want to live in 2050? tomorrow. Over the course of the forum, representatives from government, academia, the private sector and civil society provided insightful analysis and identified innovative pathways for realizing urban prosperity in Eastern Africa. The key issues raised to address the complexities of urban growth and achieve the goal of sustainable towns and cities throughout the region are covered in this publication. A new Africa has emerged. An African renaissance is underway, whereby a growing number of determined and self-confident Africans are working to transform their countries’ economies to accelerate the rate of human and economic development. Given the continent’s stage of development, Africa has the opportunity to become the catalyst and driving force for sustainable development globally. To achieve this, Africa will need to tap into its past successes whilst planning and pursuing a logical, inclusive, collective and sustainable path to national, regional and continental progress. It is against this background that the former President of the United Republic of Tanzania, H.E. 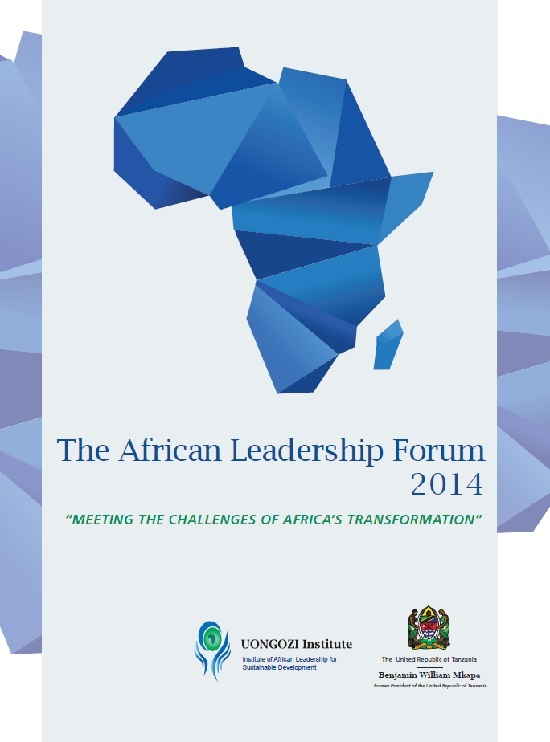 Benjamin Mkapa convened the inaugural African Leadership Forum (ALF) in Dar es Salaam on 31 July 2014. Organized by the Institute of African Leadership for Sustainable Development, popularly known as the UONGOZI Institute, the event brought together political leaders including former heads of state as well as leaders from government, business, civil society and academia. Forest Association brings together high-level leaders from government, the private sector and civil society to discuss and experience the critical issues facing the forestry industry in Tanzania. 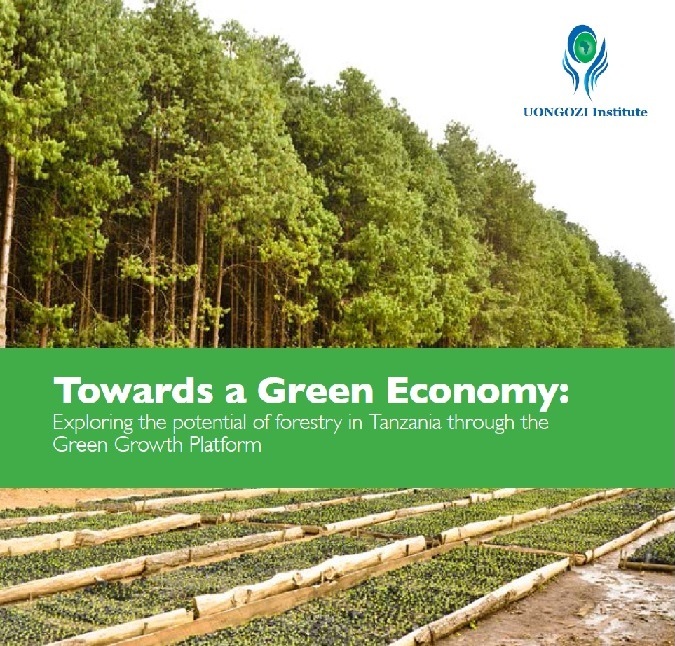 This publication introduces the Green Growth Platform and the DMFA’s unique learning approach and shares the ideas and insights from participants attending the event in Iringa. The first part of the document presents an overview of the GGP and the platform’s launch, while the second part gives an insider’s view of the presentations, discussions and field visits that were conducted as a part of the Forest Academy. Public Private Partnerships have emerged as a viable institutional arrangement for financing and delivering public services. A successful PPP capitalises on the strengths of both public and private sectors to provide better and more cost-effective public services, and to speed up the rate of implementation or coverage of services. In the context of developing countries, PPPs can help to boost economic growth, reduce poverty and improve well-being. Consequently, governments are promoting the use of PPPs within their national development strategies. 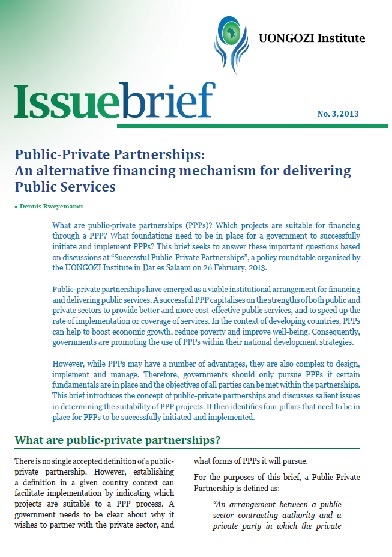 However, while PPPs may have a number of advantages, they are also complex to design, implement and manage. Therefore, governments should only pursue PPPs if certain fundamentals are in place and the objectives of all parties can be met within the partnerships. This brief introduces the concept of public-private partnerships and discusses salient issues in determining the suitability of PPP projects. for charcoal is rising as Tanzania’s population grows and becomes increasingly urban. Yet, despite its importance and potential, charcoal is not positively perceived within the national policy environment, leading to unsustainable and inefficient charcoal production, deforestation and soil degradation, lost opportunities to modernise the charcoal value chain and lost revenue for the government. 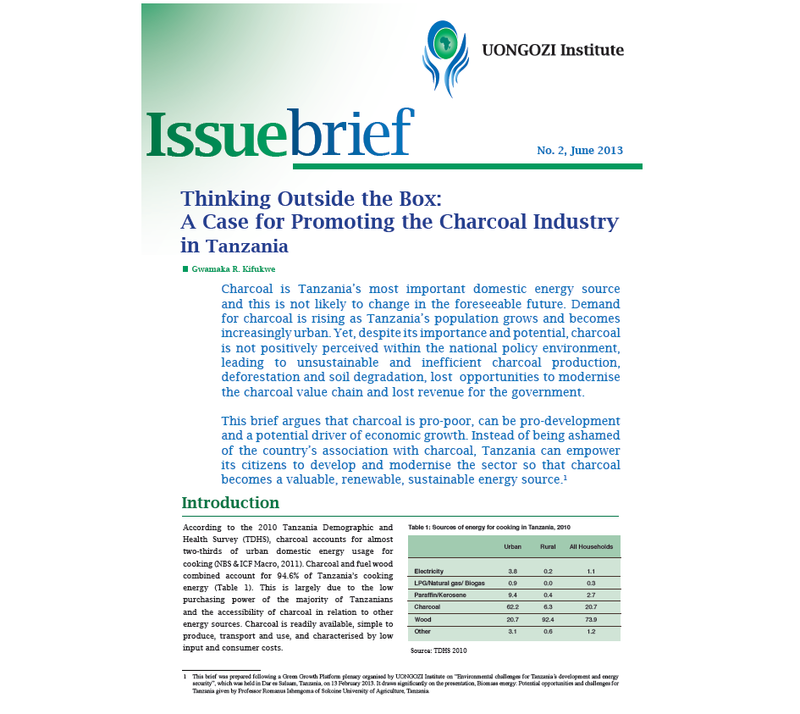 This brief argues that charcoal is pro-poor, can be pro-development and a potential driver of economic growth. Instead of being ashamed of the country’s association with charcoal, Tanzania can empower its citizens to develop and modernise the sector so that charcoal becomes a valuable, renewable, sustainable energy source. The discovery and extraction of natural resources has the potetial to finance rapid, sustained and broad-based development. However, the historical record of resource discoveries in developing countries is deeply worrying. Often discoveries have led to the plunder of those resources, whereby the few expropriate revenues that should benefit the many, and the present generation unsustainably consume revenues that should benefit future generations. For countries to avoid the recurrence of plunder and take full advantage of the unprecedented opportunity of new resource discoveries, a set of distinct policy responses are required. 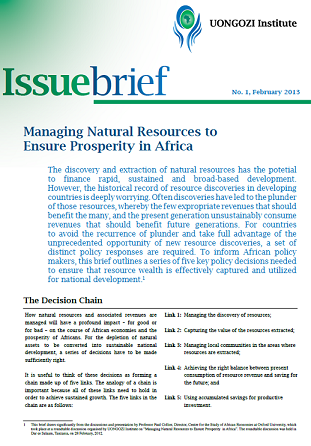 To inform African policy makers, this brief outlines a series of five key policy decisions needed to ensure that resource wealth is effectively captured and utilized for national development.